There are many reasons why I am grateful to have been born and educated in Rochester, notably the imposing castle keep, atmospheric cathedral and the close association with Charles Dickens. 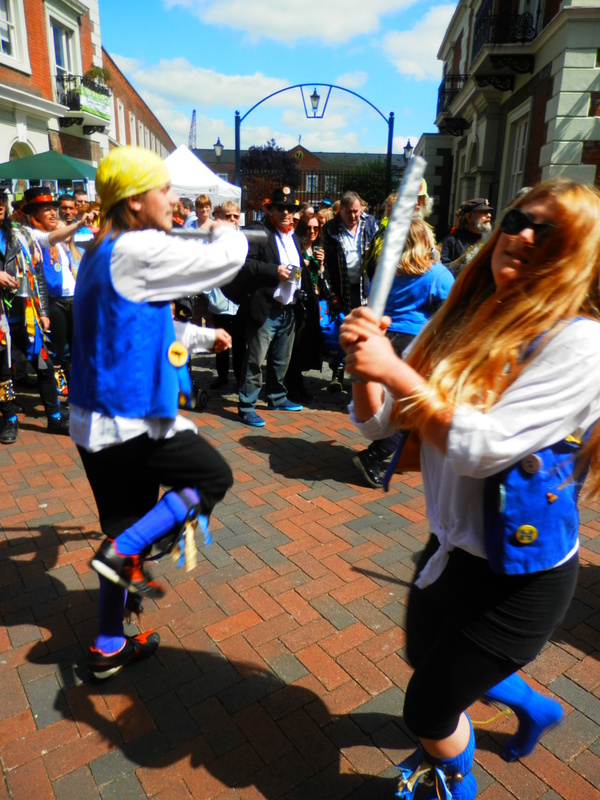 The town also hosts a series of festivals and concerts throughout the year within its ancient high street and environs. 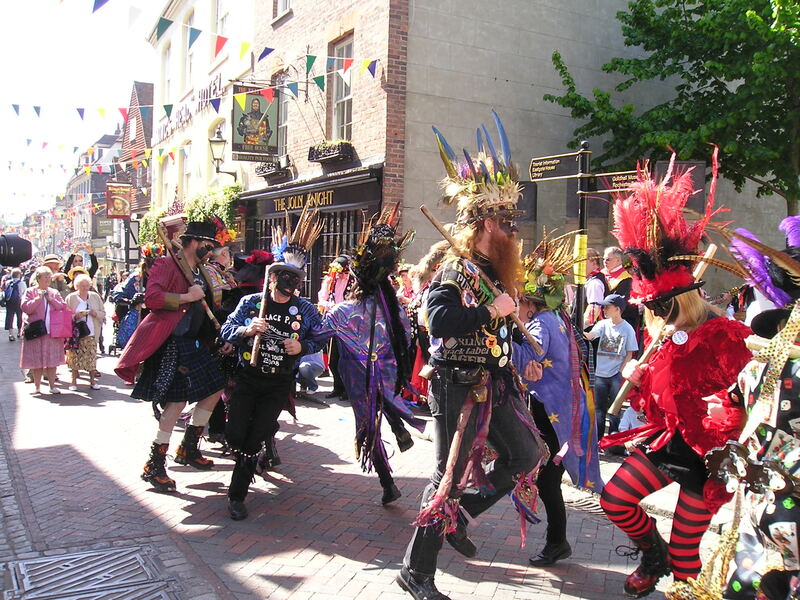 Whilst the Dickens Festival, held on the weekend after the late May holiday is the oldest and biggest, it is the Sweeps Festival over the May Day weekend that I look forward to the most. 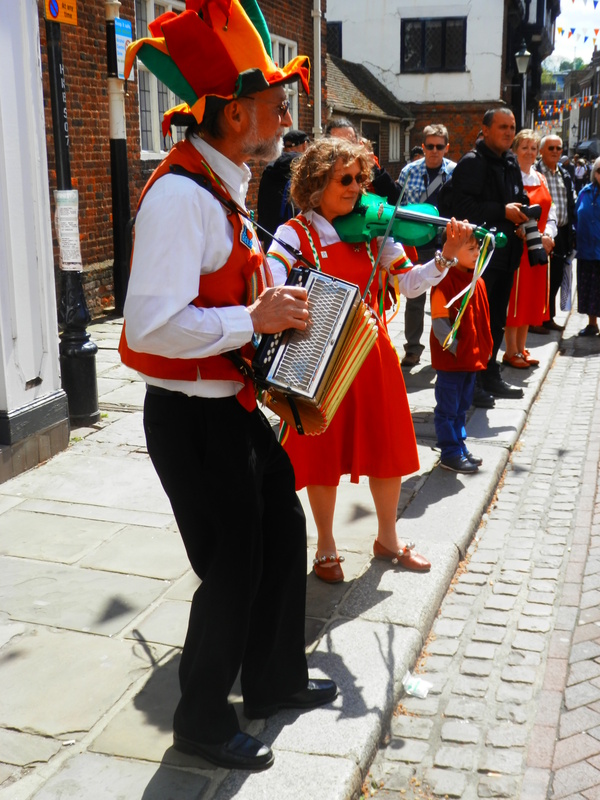 For three days the town reverberates to the sound of accordions, bells, fiddles, clattering clogs and crunching sticks in one of the largest May Day celebrations in the UK. Well, Dickens is again the inspiration for this extravaganza of music, dance and street theatre. May Day was the one day’s holiday a year for chimney sweeps or “boys” in Victorian England, and the novelist highlighted their plight. The festivities actually begin earlier – at 5.32am on 1st May to be precise. At the picnic site near Bluebell Hill, the principal road between Chatham / Rochester and Maidstone, the slumbering Jack-in-the-Green is brought back to life by sweeps, Morris Men and anyone else dedicated or foolhardy enough to rise at such an early hour. 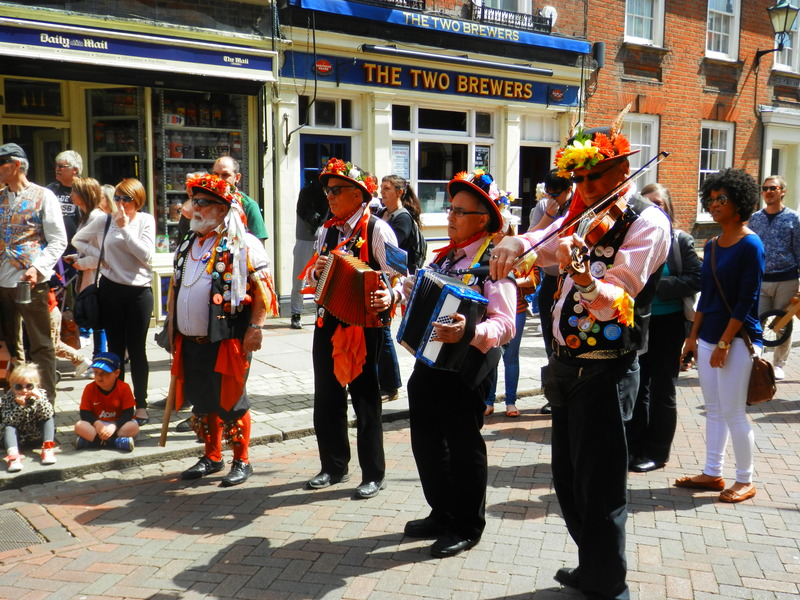 Back in Rochester, the narrow and sleepy high street stirs at around 11 o’clock each morning as shops and stall holders prepare their pitches against a backdrop of Morris sides jingling into position for their first dance. Many of the pubs host live folk acts too. As you walk from one end of the street to the other you will hear snatches from every strand of the folk tradition. Already impassable to vehicular traffic, the street soon becomes clogged (pun intended) with human onlookers, some regular devotees but many others, local residents making their annual pilgrimage to gawp at the strange people from eight to eighty dressed in waistcoats adorned with badges, hats, handkerchiefs, bells and carrying the obligatory personalised beer mug (usually pewter). The 2014 Festival, blessed with the fine weather that can make or break such an outdoors event in spring in England, was the 35th since the tradition was revived. 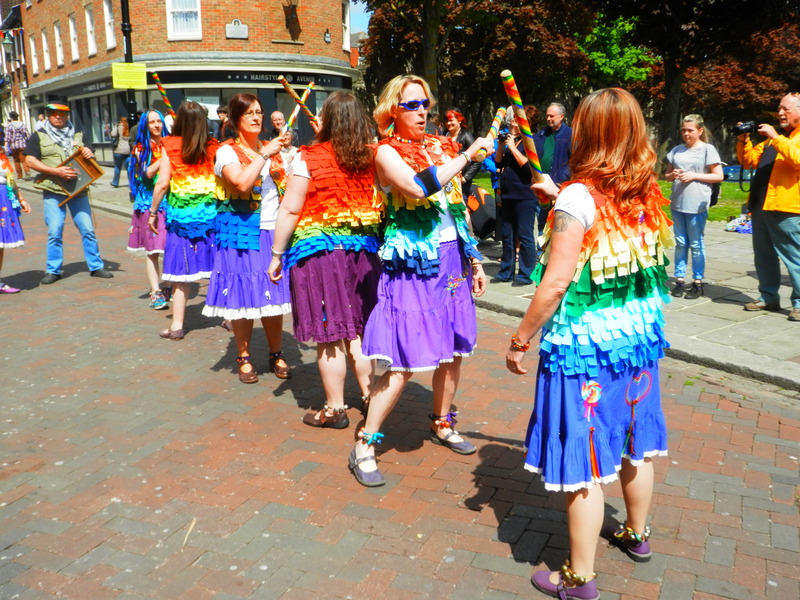 More than sixty “sides” from as far afield as Nottingham and Warwickshire performed the full gamut of Morris dances – Cotswold, Border, North West Clog and Black Face. Kent was understandably well represented with, among others, festival favourites such as Bishop Gundulfs, Kits Coty and the Loose Women. Less traditional forms of dance, notably Gothic (the Screeming Banshees) and Sand (the Fabulous Fezheads), provided added spice. The entertainment was not confined to the crowded high street. The War Memorial was home to “Busker’s Corner” and stages behind the City Wall bar and on Boley Hill leading up to the Castle allowed further opportunities for singers. The car park adjacent to the castle moat was abuzz with enthusiasts trawling through the treasures in the record and musical instrument tents. The main stage in front of the Castle was permanently in use with a succession of folk acts, and the gardens contained a food, drink and lifestyle fair, children’s fun fair and a number of other craft marquees. Back in the high street again, the music – and the drinking – never stopped. And the dances – and fashion – got weirder. It had barely been a fortnight since, empty and depressed, I’d left San Francisco. But there can have been few better tonics than a day at the Rochester Sweeps Festival, which was rounded off by a fine concert from the original English folk-rock band, Fairport Convention that evening at Chatham’s Central Theatre. Moreover, it heralded the start of the English summer – light evenings, more festivals, cricket, seaside trips. And even the prospect of some warm sunshine. Now that’s not something San Francisco can guarantee is it? Untroubled by any afternoon fog, the sun slides towards the Golden Gate before retiring for the night. White swans glide across the placid lagoon. A small boy runs after a ball, inadvertently kicking it forwards each time he reaches down to pick it up, whilst his mother checks her e mails on her new smart phone. Even the ubiquitous dogs and joggers appear to float past as if in a dream. I glance to my left at the crippling climb up Lyon Street to privileged Pacific Heights, and feel that I could not be more blessed sat here on this bench, watching the day draw serenely to its close, than if I were observing it from above in the manicured garden of a multi-million dollar Victorian. 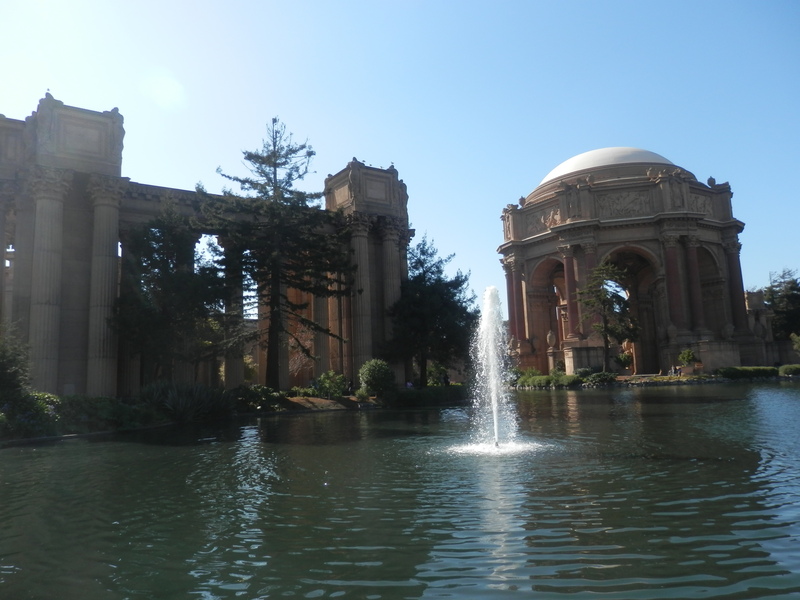 Built, along with ten other structures, on land created with sand dredged up from the bay for the Panama-Pacific International Exposition in 1915, the Palace of Fine Arts was designed to commemorate the opening of the Panama Canal, but it quickly became a demonstration of San Francisco’s stunning revival after the devastating earthquake and fire of nine years earlier. 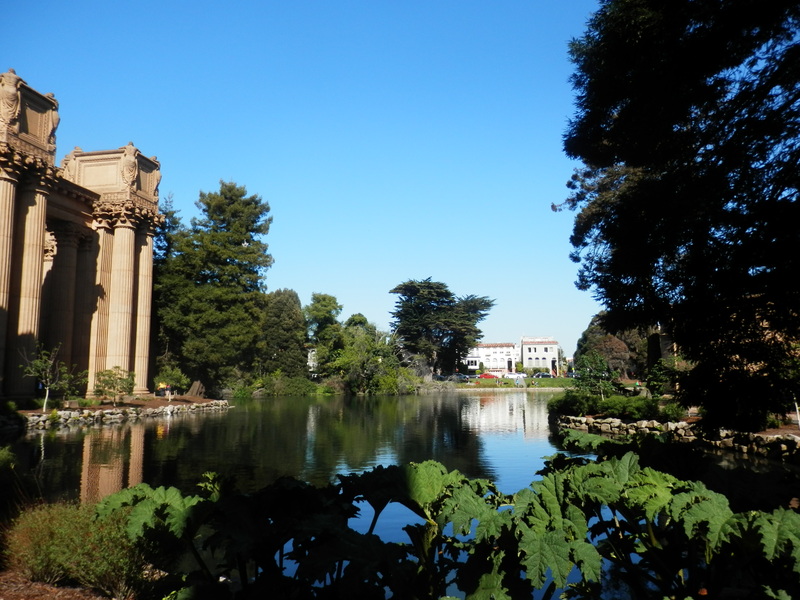 A wonderful place to re-charge your energies, meditate or wind down, especially in the final hour of daylight, the reflecting lagoon, once a frog pond, and the structures that tower over it, form a beautiful classical harmony. The forty metre high rotunda with its golden dome, visible from both the hill above and the Golden Gate Bridge to the west, may appear incongruous in a city still so young, but it is a nonetheless glorious sight, beloved of residents and visitors alike. The adjoining colonnade, with its groups of columns depicting weeping maidens “crying over the sadness of art”, and decorated with incomplete stairways and funeral urns, complements it perfectly. 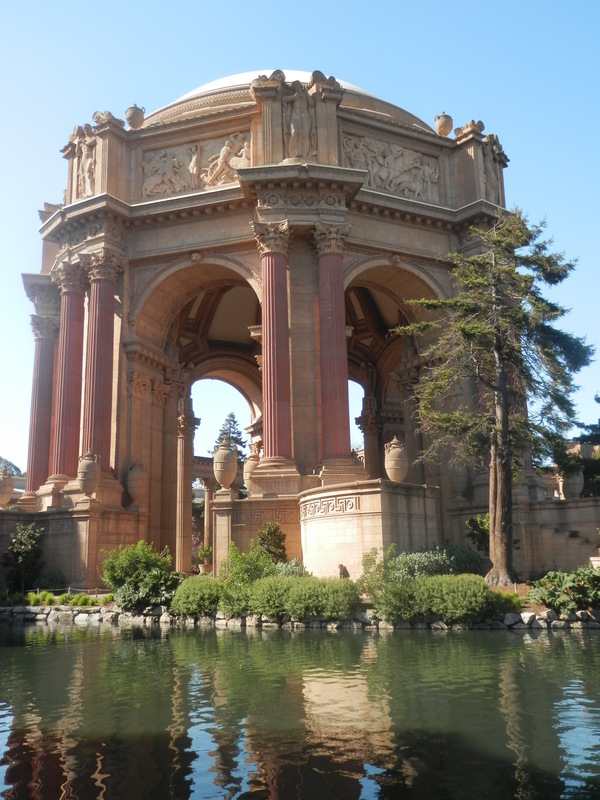 The work of Berkeley architect Bernard Maybeck, who aimed to convey a sense of “sadness, modified by the feeling that beauty has a soothing influence”, it was built of plaster over wood fashioned to resemble stone or marble. Intended to represent a Roman ruin, ironically it survived alone of all those buildings of the much lauded Exposition. It was allowed to stand for decades whilst crumbling into decay, befitting the air of “timeless melancholy” that its founders had aimed for. It helped too that, unlike the remaining edifices, it was built on Army land and escaped the prompt demolition that befell those in the dash to create the Marina residential district. Over the intervening decades it served as tennis courts, a motor pool for army vehicles and diplomatic limousines, a warehouse for city park supplies, telephone books, flags and tents, and as a temporary headquarters for the Fire Department. And then in 1957 Assemblyman Caspar Weinberger succeeded in securing $2 million from the state, which was matched two years later by philanthropist, Walter S. Johnson, who lived across the street. This roused further latent public, private and City support for its restoration. It was torn down and replaced by one in reinforced concrete at a cost of $7.5 million, and was re-dedicated on 30th September 1967. However, lumps of concrete subsequently fell from the rotunda, necessitating nets being built to protect visitors, and the lagoon became a swamp-like dump. 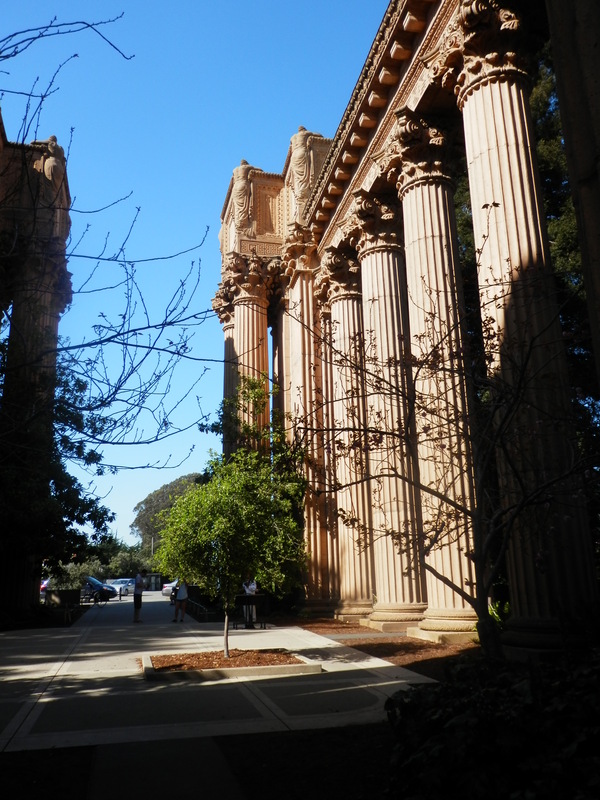 Prompted by then Mayor Willie Brown, Donna Ewald Huggins, a historian and publicist, led a further project to restore it once more. As a result, the Palace as we see it today was dedicated on 14th January 2011. It takes little suspension of disbelief to understand why it is so popular as a location for wedding shoots and film sets. As the balmy bay breeze gives way to the chill of twilight, I rise to leave. The tranquility is temporarily interrupted by another small boy, this time in a toy car chasing a pair of understandably agitated ducks around the perimeter of the lagoon. Needless to say, he loses, and peace is restored as darkness falls.